Salarpuria Sattva Opus is a brand new residential launch by the well-acclaimed Salarpuria Sattva Group, coming up in Bangalore. The developer has roped-in a team of brilliant architects, engineers and designers and has used latest technologies and top-quality materials to crystallize the home of your dreams into reality. Set up across 2.7 acres of colossal land parcel, the developed property offers 2 and 3 BHK well-planned apartments spanning 1239 sq. ft. to 1586 sq. ft. of areas. There are a total 278 residential formats that are stylized into 3 high-rise towers which are G+24 floors high. Built to perfection, the apartments make an optimum utilization of every single space available and are very airy and well-lighted with sunlight permeating all corners of the house. The project is a whole world of luxury and comfort in the four walls of the campus. The modern external amenities present here save on your travelling time as you don’t need to go to any other place and also let you relax and enjoy after a hectic day at work. The community amenities available include a fully equipped club house, multipurpose hall, table tennis, squash court, yoga, gym, library, indoor games room, sky-view blue swimming pool with a separate kids’ pool, kids’ play area, amphitheater, outdoor gym, informal jogging track, cricket practice net and a tree-lined floral garden. The dazzling property is coming up in the vibrant locality of Dasarahalli, towards north-west in Bangalore and offers you a life of comfort and ease. 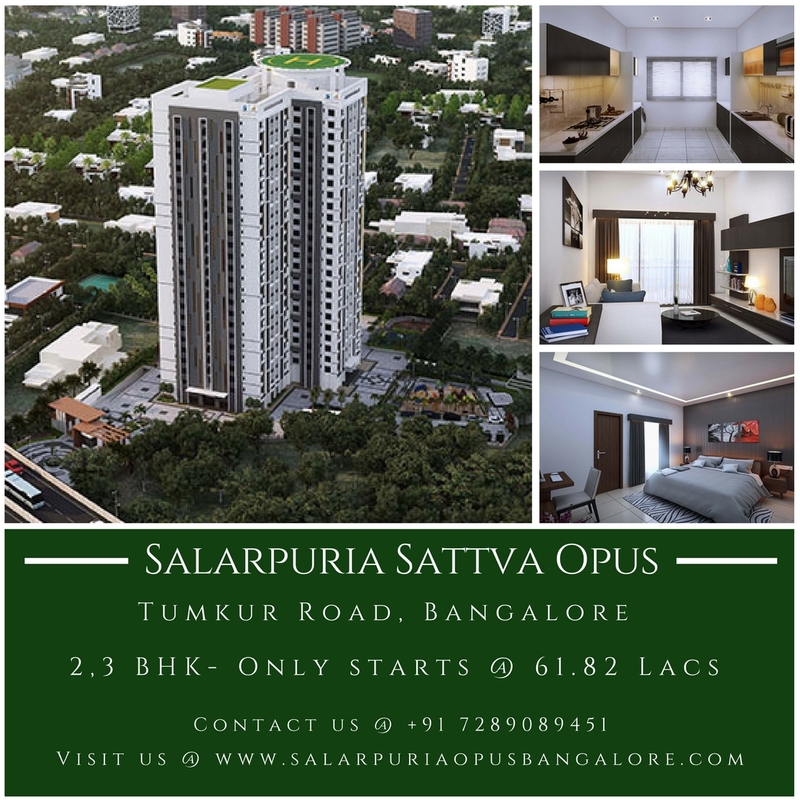 Salarpuria Sattva Opus Bangalore shares its neighborhood with basic social and civic utilities like best schools, colleges, hospitals, grocery shops, super markets, banks, etc. It provides easy connectivity to the key locales of the city like airport, prominent IT corridor, ring road and is opposite to Dasarahalli Metro Station. Salarpuria Sattva Opus price starts at Rs 61.82 lakhs and moves up to Rs 79.14 lakhs backed by smart and easy payment options for the convenience of the buyers. The average price is Rs 4990 - Rs 5190 per sq. ft. depending upon the dimensions of the apartment selected. Inspiring in design, high on luxury, low on cost in order to match everyone’s needs and requirements, and swaddled in a flourishing environment, the property is undoubtedly worth a purchase in every sense. The Salarpuria Sattva group the parent company of Salarpuria Sattva Opus is headquartered in Bangalore was founded in 1986 in Kolkata, India. It is a well known realty company which deals in both residential and commercial properties. It also functions in Hyderabad, Kolkata, Jaipur, Pune, Goa, and Coimbatore. The company is built on faith, novelty and knowledge-leadership, its main emphasis is to progress with finest constructions. It is tremendously innovative and deliver value and build faith. The firm focus has always been to achieve complete client satisfaction which it is proud of. It is distinguished by its skill to provide the most progressive work systems in the state-of-the-art industry, as well as our capacity to make up-to-date and natural choices. The results instrategic locations are well linked with access to the best infrastructure. They don't just build spaces and ripen properties; but flaunt in the entire life-cycle from understanding the detailed qualities and expectation urbane customer expectation. They envision massive expansion making their mark in maximum cities in the country with more than 30 million sft. of townships being on the anvil. The group indeed is truly delivers quality and rendered and will perpetually render all its clients their dream homes which they can cherish forever. Yoga Meditaton Plaza wi Shelter. Dasarahalli Metro Station - 100 mtrs. Orion Mall - 15 minutes. Nice Road - 10 minutes.